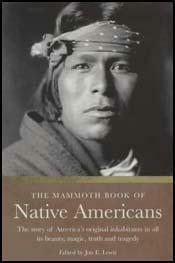 Apaches were nomadic tribes living in Arizona and New Mexico. The name comes from the Zuni word apachu (enemy). They travelled in small raiding bands or clans and lived in brush shelters called wickyups. There were six main tribal divisions: Jicarilla, Mescalero, Chircahua, Mimbrenos, San Carlos and Coyotero. There was little tribal solidarity and they did most of their fighting in small groups. On 27th January, 1861, a group of Apaches led by Chatto stole cattle and kidnapped a boy from a Sonoita Valley ranch. Second Lieutenant George Bascom was sent out with 54 soldiers to recover the boy. Cochise met Bascom and told him that he would try to recover the boy. Bascom rejected the offer and instead tried to take Cochise hostage. When he tried to flee he was shot at by the soldiers. The wounded Cochise now gave orders for the execution of four white men being held in captivity. In retaliation six Apaches were hanged. Open warfare now broke out and during the next 60 days 150 white people were killed and five stage stations destroyed. Mangas Coloradas and Cochise killed five people during an attack on a stage at Stein's Peak, New Mexico. In July, 1861 a war party murdered six white people travelling on a stage coach at Cooke's Canyon. On 14th July, 1862 Mangas Coloradas, Juh, Victorio, Geronimo and Cochise took part in the attack at Apache Pass. The Apaches also attacked stage coaches and in 1869 killed a Texas cowboy and stole 250 cattle. Cochise and his men were pursued but after a fight near Fort Bowie the soldiers were forced to retreat. Geronimo, the leader of the Chiricahua in Arizona, went on the warpath when in 1876 the American government ordered them from their mountain homeland to the San Carlos Reservation. Geronimo refused to go and over the next few years he led a small band of warriors that raided settlements in Arizona. Geronimo also attacked American troops in the Whetstone Mountains, Arizona, on 9th January, 1877. This was followed by a rare defeat in the Leitendorf Mountains. 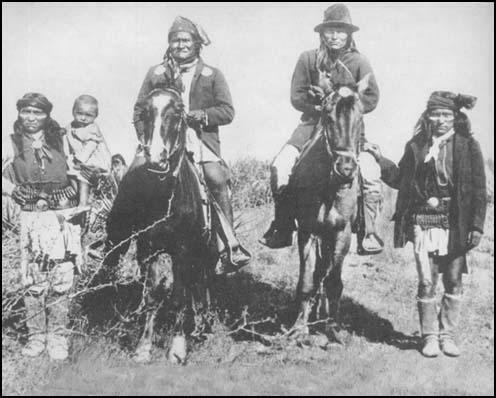 After the death of Juh, Geronimo became the leader of the Apache warriors still resisting white settlement. He continued to carry out raids until he took part in peace talks with General George Crook. Crook was criticized for the way he was dealing with the situation and as a result he asked to be relieved of his command. The Apaches believed themselves to be the first and superior race. In some respects they were superior. They excelled in activity, cunning, endurance, and cruelty. The stories of the feats of men running a hundred miles in a day come down to us from the days of Coronado and from the old officers of the army who were formerly stationed in that country. Their lung power enabled them to start at the base of a mountain and run to the summit without stopping. An account of their atrocities and raids would fill a volume. Once numerous and powerful, by almost constant warfare they have become greatly reduced in numbers. They had an abundance of arms and ammunition, for they not only raided and plundered stores, ranches, and freight trains, but they could completely conceal themselves with grass, brush, and feathers, and lie in ambush in ravines near the trail, so that the prospector, miner, ranchman, or traveler would never observe them until he felt the deadly bullet from their rifles. In this way they kept themselves well supplied with whatever they required. Their endurance was most extraordinary. When hard pushed and driven to the higher peaks of the mountains they could subsist on field-mice and the juice of the giant cactus. They would go to their reservations and agencies for a time to replenish their wants and recruit their members; then return to the warpath. Their docility and meekness while peaceable was only excelled by their ferocity and cruelty when at war. For a few weeks or months they would be "horny-handed sons of toil," and then for an equal time they would be red-handed assassins and marauders. 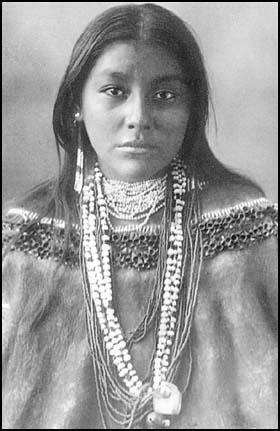 They were at times composed of the Yumas, Mojaves, White Mountains, and Chiricahuas, the last named being the dominant and most warlike tribe. Theyinhabited the most rugged and inaccessible regions of the Rocky and Sierra Madre mountains. When pursued they would steal horses in one valley, ride until they exhausted them, and then destroy or abandon them, travel on foot over the mountains, descend and raid another valley, and continue this course until they felt themselves free from their pursuers. They recognized no authority or force superior to their own will. Led by Mangus-Colorado, Cochise, Victorio, and later by Geronimo, Natchez, Chatto, and Mangus, they kept the whole country in a state of terror. The Mescalero Apache Indians, from the Fort Stanton, New Mexico, Reservation, used to make frequent raids into Old Mexico, and often attacked emigrants along the Rio Grande. On one occasion, a party from Texas, consisting of three men and their families, on their way to Arizona, came across Billy and Jess. in the vicinity of the Rio Miembres. They took dinner together and the Texans volunteered much advice to the two unsophisticated boys, representing the danger they braved by travelling unprotected through an Indian country, and proposing that they should pursue their journey in company. They represented themselves as old and experienced Indian fighters, who had, in Texas, scored their hundreds of dead Comanches, Kickapoos, and Lipans. The boys declined awaiting the slow motion of ox wagons, and after dinner, rode on. (3) Captain John G. Bourke served under General George Crook. In 1891 he wrote about an event that took place on 28th December, 1872. We reached the little station of Mount Vernon just before 8 a.m. Country poor, sandy and a growth of small pine. A road took us up to the barracks. An ambulance happened to be at the station, and a sergeant, who resented our getting in until he found out that the 'old gentleman' was General Crook. The approach to the Barracks, with great green trees on either side was very pretty. The post is walled in by a wall from 12 to 16 feet high, without flanking arrangements. It is situated on a knoll, and above the 'backwater' of the Tombigbee. We drove direct to the CO's house, rang, and were admitted. No one but the servant was up. Soon Mrs. Kellogg came down, and later the Colonel. There was also a daughter or niece. They were not expecting us. Did not know we were coming, apologized, etc., which was not necessary. A young Indian with long, black hair saw the General, and before we had finished breakfast. Chihuahua was outside, waiting. He seemed overjoyed to see the General. Kaetena joined him, and we walked over to the Indian village, which was just outside the gate of the fort. They live in little log cabins which had been built for them. At the gate was a considerable number of Indians waiting for us. Chatto came out, and went up to the General, and gave him a greeting that was really tender. He took him by the hand, and with his other made a motion as if to clasp him about the neck. It was as if he would express his joy, but feared to take such a liberty. It was a touching sight. The Apaches crowded about the General, shaking hands, and laughing in their delight. The news spread that he was there, and those about us shouted to those in the distance, and from all points they came running in until we had a train of them moving with us. All the other Indians having sued for peace, and the Indians occupying this rough country having been so severely chastised, I had some of the prisoners sent out to communicate with the hostiles, holding out the "olive branch," offering them peace on certain conditions, which were that they should all move in on the different reservations and abstain from all depredations from that time forward. They promptly responded to my proposition, and all within reach came in at once. So, on the seventh day of April, 1873, the last of the Apaches surrendered, with the exception of the Chiricahuas under Cochise, whom General Howard had taken under his wing. Had it not been for their barbarities, one would have been moved to pity by their appearance. They were emaciated, clothes torn in tatters, some of their legs were not thicker than my arm. Some of them looked as if though they had dropped out of a comic almanac. The Apache is becoming a property owner. It is his property, won by his own toil, and he thrills at once with the pride of acquisition, and the anxiety of possession. He is changing both inside and out: exteriorly he is dressed in white man's garb, wholly or in part. Mentally he is counting the probable value of his steers and interested in knowing how much of his corn crop the quartermaster may want next month. We stayed in camp about a month, killed mustangs, antelope, buffalo, deer, etc., enough to run the old warriors, the manikins and the women until we came back, and then we started on another stealing expedition. We only took the ponies we rode, each of us mounted on a separate pony, our guns primed and ammunition handy, besides a supply of bows and arrows. If a horse gave out, that Indian had to take it afoot until he could steal one," but if we got in a tight we took him up behind. We came south-east about one hundred and fifty miles and camped on a little ravine. Scouts were sent out and soon they returned and reported three men headed toward us. We all hid in ambush and made ready, but just as these men rode up we were discovered and fired upon, and one horse was killed. We vigorously returned the fire and they ran, but continued to fight. We caught one man and he spoke Spanish. We asked where his camp was and he told us it was over the mountain, but that it was deserted and that the men were all away chasing buffalo. The Indians left me to guard the prisoner, and they charged over the hill and on to camp, but instead of an easy capture, a volley of balls met them. There was a crowd in camp and they had fortified the place with rock. The Indians were repulsed and one wounded in the leg. The Indians came back and ordered me to murder my prisoner. He picked up a rock and hurled it at me; I dodged the missile and fired in the air but my arm grew steady, and I fired again, killing him instantly. I pounced upon him and soon his bloody scalp was dangling at my belt, and I was the proud recipient of Indian flattery.